November 5th 2016 marks the 100th anniversary of the Everett Massacre, known as the bloodiest event in Washington labor history. As many as a dozen from a local historical labor organization, Industrial Workers of the World (the I.W.W.) 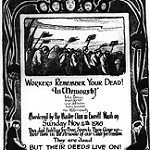 may have lost their lives, as they faced off with squads hired by businesses and commercial interests supporting the five month long strike of our local shingle workers at the time. The members of local non-profit organization, Pacific Northwest Labor History Association, will commemorate the massacre this month. KBCS Reporter David Griffith talked with spokesman Ron Mcgehee. The Pacific Northwest Labor History Association is hosting an Everett Massacre Commemorative Boat Tour on November 12, 2016.